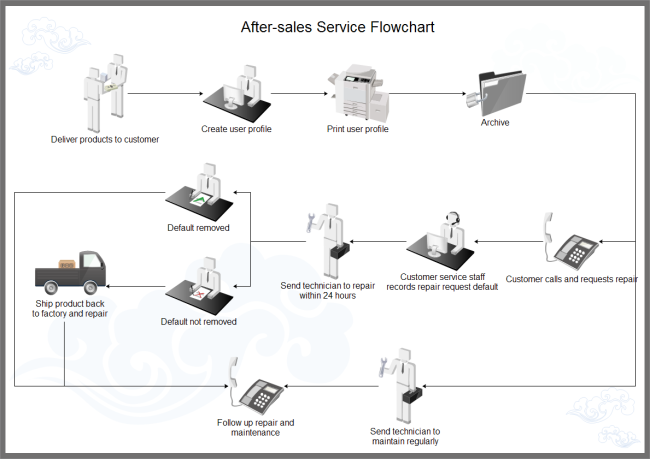 It depicts the workflow of after-sales service visually from the product delivery and the follow-up of product usage. After sales service refers to the service provided to customers in the aftermath of a sale such as maintenance and repair. For example, after being sold a bike, after sales service may involve free bike maintenance for a number of weeks. 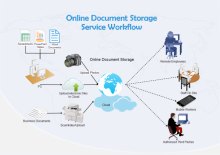 The sequence of people or documents involved is displayed clearly step by step by the arrows in this graphic. Perfect alignment, distribution and formatting allow instant use. 3D vector shapes which have action buttons and control handles empower easy adjustment. Auto connection function provides flexible flow presentation. Additional symbols(over 6000) bring limitless possibilities in visualization. One set of themes offer one-click change of overall style including color, line and text format. Believe it or not, this workflow diagram can be even made someone knowing nothing about drawing. It is a work of Edraw with predefined shapes and powerful functions. All the shapes are prepared in advance by Edraw team. Users just need to drag and drop shapes, align them and click the action button to generate connectors. Done! Furthermore, the background is also one of the built-in shapes. If you don't like it, just change another one in 1 second, only 1 second. A prepared and well-formatted workflow example is the perfect solution for those users who need to build a diagram in a rush but also require professional results. Click the picture to see full size and download. This example can be transformed into other formats by exporting. Learn how to do it in article: How to Export Edraw to Other Formats. 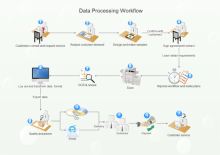 Creating a workflow diagram in Edraw is fast and easy. It reduces much manual operation and take out much pain in formatting, enabling anyone to gain marvelous result with little effort. 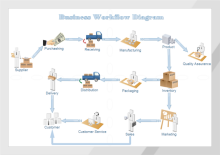 This example uses 3D shapes to visualize business workflow clearly. Even the arrow connectors have connection points, two. Click the right thumbnail to enlarge and download. Make some modifications if necessary.